Jack Holt of the University of Texas and his graduate student Isaac Smith used radar data from MRO's Shallow Subsurface Radar to crack the case. Examining the details of this new data set has laid open the ice cap's internal structure, revealing clues to the massive ice troughs' formation. Apparently, the wind did it. "Radar cross sections reveal layers of ice deposited throughout the ice cap's history," says Holt. "The size and shape of those layers indicate that wind has played a key role in creating and shaping the spiral troughs." Not only does wind shape the spirals, but also it causes them to move. They rotate around the north pole, turning like an excruciatingly slow pinwheel, curiously enough, against the wind. Smith explains the process: "Cold air from the top of the ice cap sweeps down the slope, gaining speed and picking up water vapor and ice particles along the way. As this wind blows across the trough and starts up the other slope (the cooler side, facing away from the sun), it slows and precipitates the ice it holds. All of this ice is deposited on this cool slope, building it up, so the trough actually grows and migrates, over time, against the wind." Alan Howard of the University of Virginia first suggested the ice trough migration model based on Viking spacecraft data back in 1982. His theory, that wind erosion and sunlight shape and move the troughs, was never widely accepted, but the new data supports it. 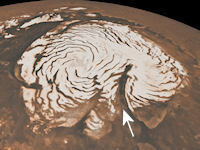 The Coriolis force generated by Mars' rotation twists the winds sweeping down from the ice cap. "That explains the troughs' spiral design," says Smith. 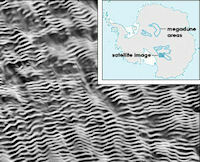 Similar formations can be found in Antarctic regions of Earth, but without the spiral shape. "You don't see spirals in Earth's Antarctic ice sheet because local topography there prevents the winds from being steered by the Coriolis force." The radar data have solved another icy mystery, too--the origin of Chasma Boreale. Chasma Boreale is a Grand Canyon-sized chasm that slashes through the midst of the spiraled troughs. Theories to date suggested that either wind erosion or a single melt event excavated Chasma Boreale within the past 5 to 10 million years. "Not so," says Holt. "The MRO data clearly show the chasm formed [long before the spirals did] in a much older ice sheet dating back billions of years. Due to the shape of that ancient sheet, the chasm grew deeper as newer ice deposits built up around it. Winds sweeping across the ice cap likely prevented new ice from building up inside the chasm [so it never filled up]." The radar data also revealed a second chasm matching Boreale in size. "This chasm's never been seen before -- unlike Boreale, it did fill up with ice, probably because it's in a different location. Boreale is closer to the highest points of the ancient ice cap, where the winds are stronger and more consistent." By discovering that both Chasma Boreale and the ice troughs were shaped by similar processes over different timescales, Holt and Smith answer some questions about Martian climate history. But they're also sparking new ones. 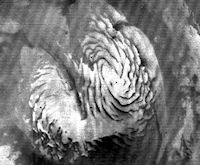 "For a long stretch of Martian history the ice layers were regular and uniform, then there was a distinct period when the spiral ice troughs got started," says Smith. "Something changed. There must have been a very fast (relatively speaking) and powerful change in climate. We still don't know what that change was." "To figure that out, we need to look at the rest of Mars for evidence of other changes at that same time," says Holt. "This is just the tip of the ice berg." Credits: Holt and Smith, both from the University of Texas at Austin's Institute for Geophysics, were lead authors on two papers on this subject, published in the May 27, 2010 issue of Nature. Co-authors on the paper "The Construction of Chasma Boreale on Mars" include Kathryn Fishbaugh (Smithsonian National Air and Space Museum), Shane Byrne (Lunar and Planetary Laboratory, University of Arizona), Sarah Christian (University of Texas Institute for Geophysics and Bryn Mawr College), Kenneth Tanaka (Astrogeology Science Center, U. S. Geological Survey), Patrick Russell (Planetary Science Institute), Ken Herkenhoff (Astrogeology Science Center, U. S. Geological Survey), Ali Safaeinili (Jet Propulsion Laboratory), Nathaniel Putzig (Southwest Research Institute) and Roger Phillips (Southwest Research Institute).